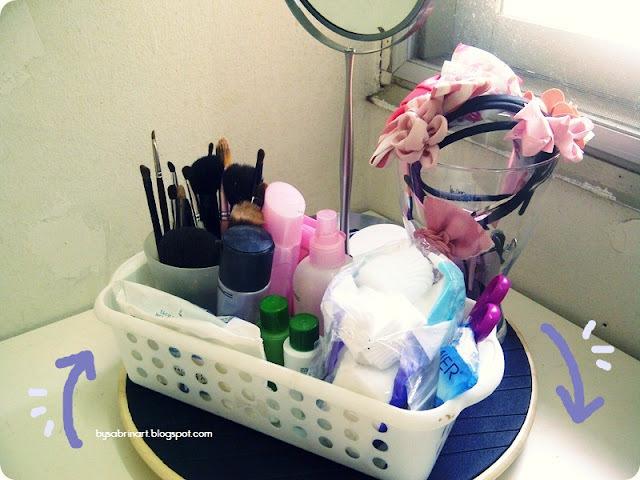 How I organize my essential everyday stuff & hair accessories *Corousel Style! Hello everyone! (Waving excitedly!). How are you guys been doing? Yeah! I move to a new apartment! Alhamdulillah my challenge for that is settled. I got a whole new room and I love my room so much! The size of my room is just nice for me, and it has the best lighting ever! It is still in a mess, but still I manage to organize things properly here. So today, I’m going to share with you guys on how I make my own “CarouselOrganizer”! This organizer it not that raved about. And it is been use by crafty people. I saw some ladies have been using it to store their brushes and other everyday essential stuff. The price is quite expensive. So I came out with a plan, I went to the HAPPIEST PLACE ON EARTH! IKEA! It is located at Damansara here in Malaysia. I manage to get some stuff there for my new room, some new bedding and pretty other small stuff. 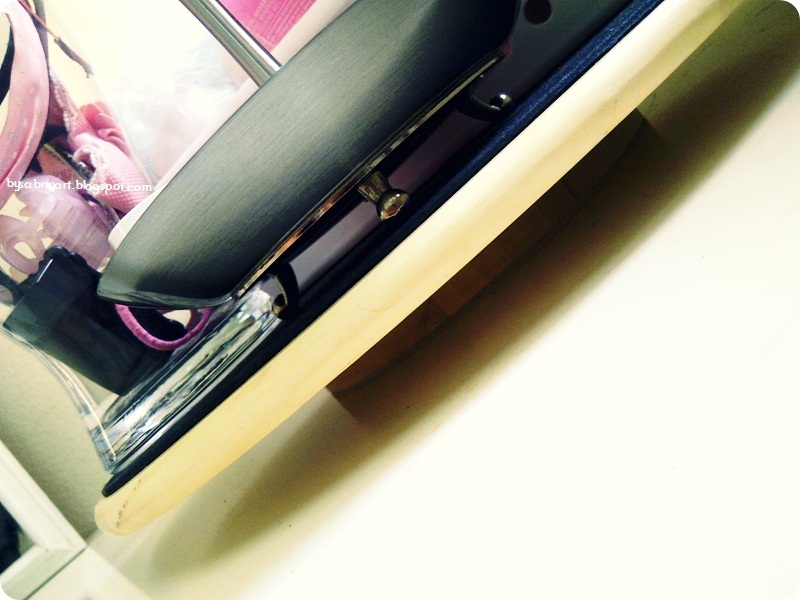 As you can see in the picture shown, I have the wooden spinning table is called SNUDDA. It’s a solid wood that spins! Usually people will use it on a dining table. The mirror is called LILLHOLMEN. A rotatable mirror with two different mirror zooming. The bowl is so convenient! The vase is the best find ever! The cheapest vase I found and it fits my headband so perfectly! It is called the VASEN.I have a lot of fancy cute headbands, but I never wore it outside in public! Haha! I use it while doing my makeup or while applying my makeup to keep my hair from falling to my face while doing makeup or applying skincare and sleep! I love being very fancy while sleeping in my pajamas! Ok, I burst that out! Sshhh! 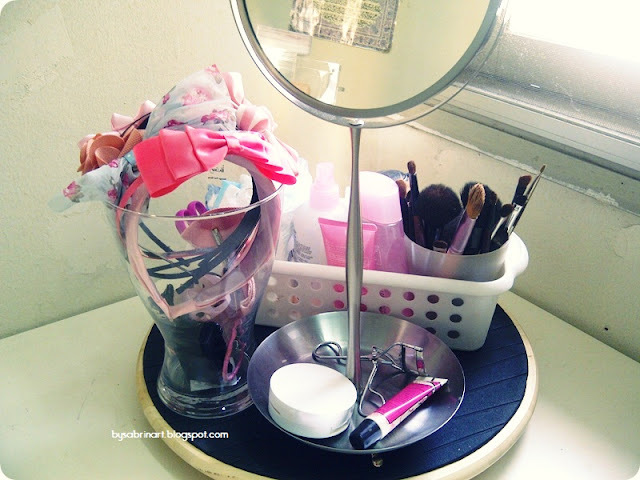 The Lazy Susan spinning table really helps me out on my daily routine. 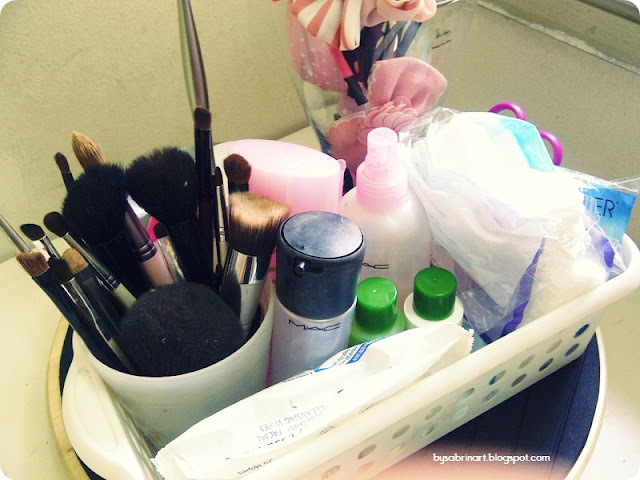 It does reduce a lil mess while I’m doing my makeup or applying makeup. I know you guys experience it too right! The vase is very practical. 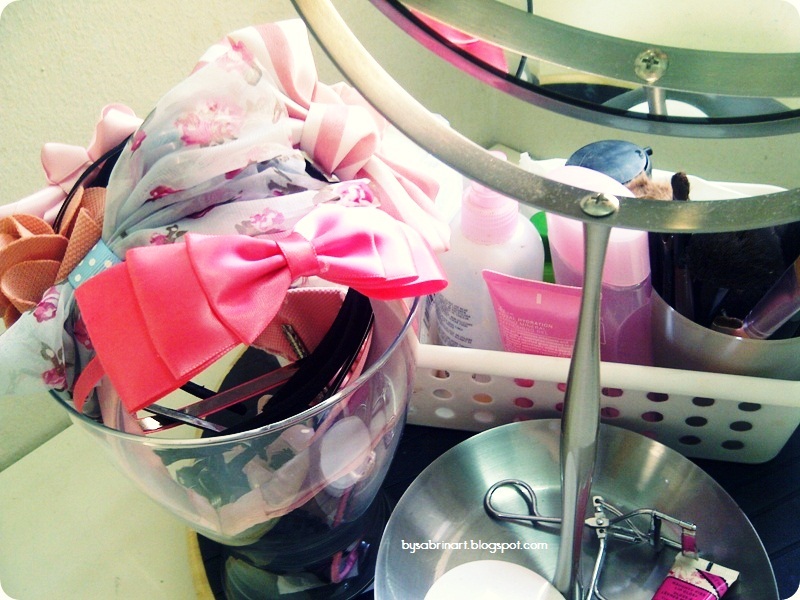 I can just throw all my hair accessories in there while the headbands look like a very nice decoration to me! More information on these IKEA items, click on their names. Well, that’s all. Pop up any question in the comment section below. I would love to hear you guys out. I hope this helps! What is your essential everyday stuff? How do you organize them? Your comment is like makeup! I love them! i want your headband pleaseeee!! i love the mirror! how much did you get it for my dear? i have the same white basket like yours that i got from jusco. Super convenient to have to avoid clutters back in my hostel room. haha. p/s: sab, where'd you get the brow brush from? It RM29! It is from ikea, search around bathroom essential section. :D oh my! Sama! Yeap! Jusco! They have in many different size right! And so cheap! Around rm2+! *i got my brush from an art store. At the brush section. If you can see, at first and second picture, the tallest brush is the brush that I mention. Its actually a paint brush! But it works great for my brow! Hehe! I am more attracted to you .... What is your opinion? I am not avery tidy person, i can clutter everything in seconds! haha! But I try to organize my stuff everytime. Thank you! Followed! You have a very nice blog! I love your mirror, might buy it next month. haha. I just found your blog this afternoon and found out it is very interesting!!! I'm addicted to read all of your posts. I guess I'm gonna be your stalker :P hahaha. go get it! its is so convenient! so sweet of you! you totally made my day!